Pratana Coffee Talk: WHAT IS CHICK-A-FILL-A FORCING ON PEOPLE NOW? WHAT IS CHICK-A-FILL-A FORCING ON PEOPLE NOW? As we can all recall, Chick-Fil-A was the center of controversy as they were accused of “forcing their religious views” on others when president Dan Cathy made his political leanings known regarding gay marriage. You’ll never guess what the once demonized business is now forcing on others now – FOOD. Yep, that’s right, food. 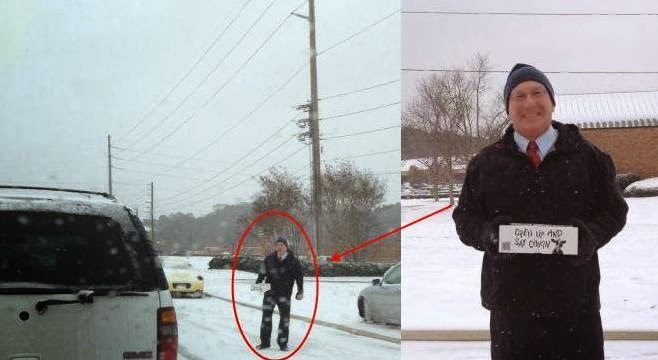 According to Fox News, a local Chick-Fil-A came to the rescue as a rare snowstorm in the South left citizens stranded on icy interstates and highways, including Highway 280 in Birmingham, Alabama. Thanks to the kindness and generosity of the restaurant employees and owner, Mark Meadows, a good number of stranded motorists were able to find food and shelter from the storm. The staff of the Chick-fil-A, a company founded on Christian principles, decided to lend a helping hand to the drivers – some of which had been stuck in their cars for almost seven hours without food or water. The stranded employees that had returned to the restaurant cooked several hundred sandwiches and stood out on both sides of Highway 280 and handed out the sandwiches to anyone they could get to, slipping and sliding as they braved the falling snow and ice. The best part – the meal was a gift and Chick-Fil-A refused to take a single penny for the sandwiches. Chick-Fil-A’s generosity didn’t stop there. After delivering the food and even helping drivers maneuver along the icy road by pushing a car up an incline, the owner and staff took it one step further and opened up their dining room to anyone who wanted to sleep on a bench or a booth. This morning, the weary staff members fired up their ovens once again and began preparing chicken biscuits. The only thing that Chick-Fil-A has closed is its cash register, giving the stranded motorists another free meal. Chick-Fil-A played out the biblical values they were once fiercely criticized for following. Will this example of Christian values receive the same publicity as the others Chick-Fil-A once verbalized? Unfortunately, it’s doubtful, but for whatever it is worth, Mad World News applauds Chick-Fil-A for their ongoing demonstration of Christian values. We hope our readers will give Chick-Fil-A the positive media coverage they deserve by sharing this story on social media.